This is a 4BBL intake manifold to fit all 345 or 392 V8 engines used in Scout II, Travelalls, pickups, Loadstars, busses, and many other trucks in the A, B, C and D series. This is a squarebore manifold that fits Holley square bore carburetors. This will NOT fit the 266 or 304 engines, nor can it be made to fit. Those motors were low-rise motors and never had 4 barrel manifolds made for them. 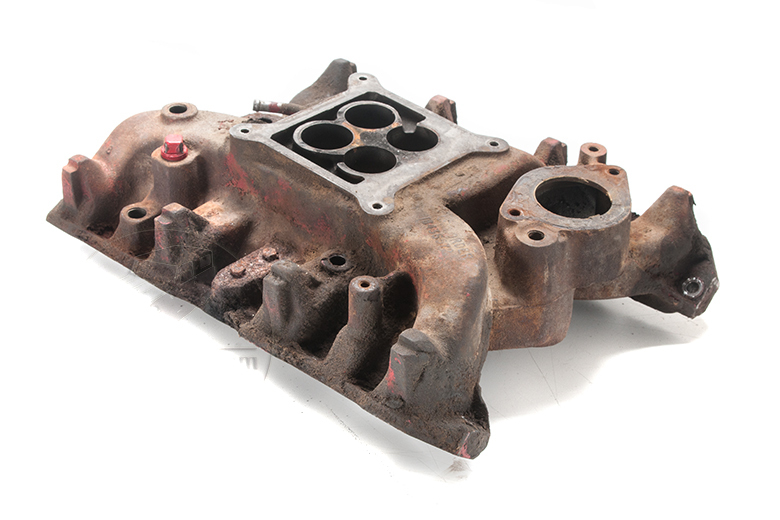 There was also a spreadbore manifold available which fits the Carter ThermoQuad and AFB and AVS, as well as the Holley spread bore carbs and the Rochester QuadraJet. If you want to use those carburetors, let us know and we will find one for you.